Wow! Talk about a powerful little card! This is truly your "checkbook in disguise" that makes shopping fun and easy. No check writing, no searching for your ID – just let the clerk swipe your card! This card also serves as your ATM card. There is no annual fee and no transactional fee, which makes it fun and easy! Stop in and apply today! Wouldn't it be great if you could check your account balance - wherever you are, whenever you want - just by touching your smartphone? Now you can with SHAZAM BOLT$, the new mobile app that lets you track your account 24/7. The easy-to-use app works on your smartphone, tablet, or home computer. Like a high-tech early-warning system, SHAZAM BOLT$ can immediately alert you to any potentially fraudulent activity. By keeping track of your purchases you can help limit fraud transactions from happening. If you lose your card(s), you can log into SHAZAM BOLT$ and temporarily block any transactions from going through until the card is found. Also, you can send money to people via email, using your PIN number to securely transfer funds. There is no charge for this service, however there may be a charge for additional services if any are added in the future. Download for free from the iTunes App Store, Google Play, or for your home computer at SHAZAM BOLT$. Getting started is easy - just follow the instructions on screen and we are always here to help if needed. 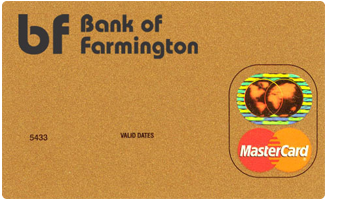 Bank of Farmington is excited to provide a new personalized debit card service. Now, you can create a personalized debit card featuring a photo of your choice or select an image from the online gallery. Choose a picture of loved ones, friends, a pet, or of your favorite vacation spot. Customizing your card is simple! Just upload your image, rotate it, shrink it, enlarge it, flip it and even preview it before you place the order. Make your card YOUR card! We are now pleased to offer you three different credit cards to choose from. All three cards are available in two options, Low Rate Card & Preferred Points Card. With competitive annual percentage rates (APR), 24-hour toll-free customer assistance, and online account information available 24/7, our credit cards are full of benefits. There is also no annual fee! The Preferred Points card allows you to earn points that you can redeem for rewards. You can use these for cash-back, retail gift cards, travel and a wide variety of merchandise. We make it easy to choose the credit card that is right for you. Cards are available in two options, Low Rate Card or Preferred Points Card. ● 24-hour toll-free live customer assistance available at (800) 367-7576. ● Online account information available 24/7 at www.cardaccount.net. ● Rental car collision damage waiver protection. ● Unlike some card offers, the APR* for purchases and cash advances is the same. We do not charge a higher rate for cash advances. ● 25-day interest-free grace period on all purchases. No grace period on cash advances. ● Other fees may be charged, these fees are listed on the downloadable application. ● Use your Preferred Points Card to earn points that you can redeem for rewards. Earn one point for each dollar spent, up to 10,000 points per month. 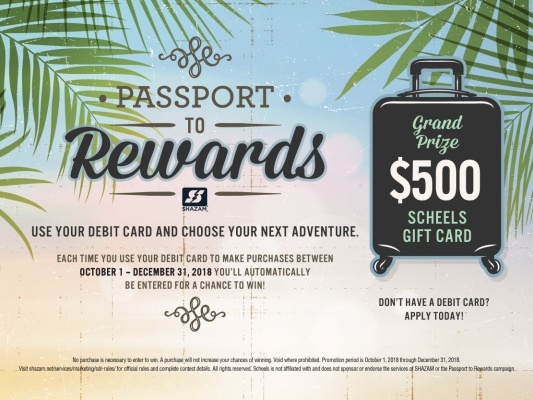 ● Redeem your rewards points for cash-back awards, retail gift cards, travel and a wide variety of merchandise including cameras, mp3 players, home theater systems, portable DVD players, sporting equipment, jewelry, luggage, electronics, video game equipment, gift cards and more. ● Cash advances can be made for up to 50% of the credit line. ● To view or redeem rewards points, visit www.mypreferredpoints.com or call (866) 678-5191. ● Download the PDF Application. ● Type the information and then print the application (you cannot save the document, so print an extra copy for yourself), or print it and then complete it using a blue or black pen. Paper applications are also available at our local branch office. ● Fax your completed application to the Card Service Center at (972) 650-7054. Or mail your completed application to: Card Service Center, PO Box 569120, Dallas, TX 75356-9120. The more you use your debit card, the more chances you’ll have to win! Don’t have a debit card? Stop in and apply today! No purchase is necessary to enter to win. A purchase will not increase your chances of winning. Void where prohibited. Promotion period is between October 1, 2018 and December 31, 2018. Visit https://www.shazam.net/services/marketing/sdr-rules/ for official rules and complete contest details.